Having been skipped over in Pokémon Black & White, the Safari Zone makes a triumphant return, but with a twist! Located within Kiloude City is the special Friend Safari. This is the new Safari Zone for the modern age. 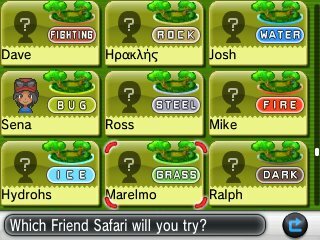 instead of having a set, defined, list of Pokémon you can encounter in the areas, this game applauds people who have numerous friends on their 3DS. If you have someone added, then they will appear on a list, with them being designated a certain type at random based on their Friend Code. This type, and the Pokémon within it, cannot be changed. With each person, you get up to three Pokémon within each specific area, with the third Pokémon slot appearing should the person have defeated the Elite Four, with them getting Hidden Abilities if the player has been online at the same time as you. 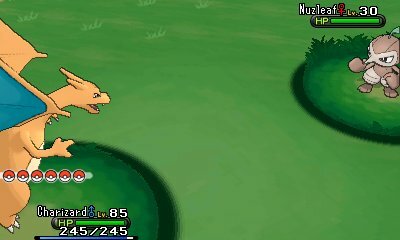 It also appears that the Pokémon found within the Friend Safari have got two IVs of 31. The Pokémon within the Safari Zone are a very diverse group of Pokémon, including Pokémon not natively in Kalos. It also can include various starter Pokémon such as Ivysaur, Wartortle and Quilladin. All Pokémon encountered within Friend Safari are Level 30. Finally, many of the Pokémon found within the Friend Safari have got a chance of having their Hidden Ability, including the Kalos Pokémon. The Pokémon found in it also don't take version exclusivity into consideration, so you may be able to find Pokémon not natively in your version. This Safari Zone also differs in that you don't have a set time to do this. In addition to that, you can send your Pokémon out in the battle and you get to use your own balls rather than Safari Balls, making it a much stronger experience.